USB Type C on ZenPad S 8.0 (Z580CA) is USB 3.0 not USB 3.1 Gen 2 – What it means. We’ve made mention of the USB Type C port on the hero ZenPad, the Z580CA. We need to revise our thoughts of “value added” in terms of this USB Type C port. Saying we are annoyed may be an understatement. At times technology companies and organizations are clueless. In this case, we say USB has gone off the rails into la la land, the land of confusion and double speak. The world of USB ports is a confusing one and the latest generation port, Type C, only adds to this confusion. The average consumer out there is not going to read article after article online about what is or isn’t USB Type C. Saying that a device comes with a USB Type C port is really misleading actually. There needs to one other important spec added to that listing. USB Type C can run USB 3.0, USB 3.1 Gen 1, or USB 3.1 Gen 2. If you have a USB Type C 3.1 Gen 2, then you are getting some future proofing. There are going to be additional options using that port beyond just data transfer. It’s quite exciting really, but you need to pay close attention to what USB Type C you’re getting. In the situation with the ZenPad S 8.0 (Z580CA), it runs USB Type C, but it’s running USB 3.0. That means you get some fast data transfers (5Gbps Superspeed), but that’s it. Here is where it gets confusing. USB Type C that is 3.0 or 3.1 Gen 1 are the same thing! So you could say that the Z580CA has USB Type C 3.1 Gen 1. 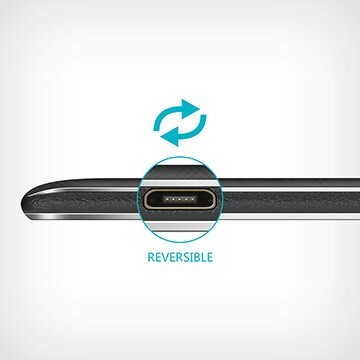 Certainly USB Type C is by far a more reliable and user friendly port because it’s reversible and can be plugged in upside down, or right-side up. Further, it’s a much more snug fit and will outlast the microUSB style ports. USB Type C connections are meant to last and that’s certainly some added value. So to summarize, the USB Type C port on the Z580CA tablet is running USB 3.0 and not the other standard (USB Type C 3.1 Gen 2) that you may be reading about. There will be a lot of talk about USB Type C 3.1 Gen 2 in the near future, but just understand that those features won’t be available using the USB Type C port on the ZenPad S 8.0. It’s a better port than what you find on the Z580C, but it’s not as big of a selling point as we originally thought. We do think it’s a problem that retail listings don’t elaborate on the true specs of the USB Type C port on the Z580CA tablet. It’s not enough to just say it comes with USB Type C.
Specs as seen on official Asus.com product page. So how did we know what USB Type C standard is used on the ZenPad S 8.0? We can say for certain that it wasn’t from any retail listings. It also wasn’t from the official Asus.com product page either. Check out this screenshot below and see for yourself. Can you guess where that was from? If you guessed Computex 2015 you would be correct! Gold star for you. If you’ve seen USB 3.0 associated with the Z580CA tablet anywhere online, please share you find in the comment section. We simply haven’t found that detailed spec anywhere else. So can this port deliver HDMI or not? Does the usb-c port allow for connecting external hdd or ssd drive? I went to a store and tried it with an apple usb-c to usb-a adapter and couldn’t get it to detect my ssd drive. Does the usb-c port allow for connecting external hdd or ssd drive? I’m not entirely sure on the answer to this. My best guess is no, because it’s a Gen 1 connection, which means it’s essentially USB 3.0. So no USB dongle support? That is years old technology… I have had my Z580CA a couple of weeks now, the locked bootloader and apparent shortcomings of the power/data connector are disappointing. I would have no complaints with the USB-C if it at least provided all the options of USB mini…. Maybe the extra money fora Samsung is worth it, ODIN software, unlocked bootloader… You almost think ASUS forgot they made the Nexus. So the USB-C 3.1 Gen 1 port cannot support OTG and connect the S8 Tablet to USB fingers?? I mean so the USB-C 3.1 Gen 1 port cannot support OTG and connect the S8 Tablet to USB fingers?? Or can we use a USB 2 expansion hub to connect to USB fingers to the S8 Tablet?? So what are some examples of what the port can be used for, Thank you. Will I be able to use the USB-C 3.0 port with/as a OTG cable USB-C to USB-Mini-B cable? This is a “Must” for me! The Asus S8 Z580C and CA does NOT support OTG. I just found this out so I will NOT be buying it. Why buy these expensive Tablets when they don’t support OTG. Try contacting Asus, better yet do a search on: Tablets that have OTG support. You will find very few new ones 2016. It’s unfortunate that you are very wrong, and ill-informed. I bought a Type-C OTG cable from Amazon, as this tablet was my very first Type-C USB device. I, too, have had my z580ca for couple of weeks. The GPS is outstanding!. I used 8 tracking app with a 10-foot no till drill seeder and I could have watch the tablet and never look back. And Astor researched extensively, I could not find a faster or better 8 inch tablet then the z580ca. I too wish that it was more future protected, but there can be no gripes about an excellent product.